I am going through the Rolling Stone Top 500 albums of all time list. I am cheating a bit by starting at 100 and working my way to number one. Not a big fan. "C-"
Song good rhythm and songwriter "C+"
Some classic songs, but not the most showy record "B-"
been a single disc instead of two. Maybe it was when I listened to it, but it produced headaches. Ol Hank seems like a bit of a jerk. Not a bad writer. "C"
92  Buddy Holly "20 Golden Greats"
91  Elton John "Goodbye Yellow Brick Road"
90  Stevie Wonder "Talking Book"
First time I heard this album. Not bad. 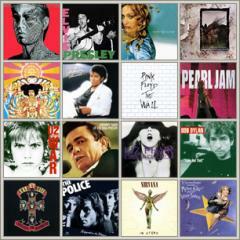 "C+"
89  Dusty Springfield "Dusty in Memphis"
88  Johnny Cash "At Folsom Blues"
Best album on the list so far. Energy, songwriting, rebellious spirit. "A-"
87  Pink Floyd "The Wall"
Another classic album. Some great songs, but a little too long, self endulged. "B+"
86  Bruce Springsteen "Born in the USA"
85  Aretha Franklin "Lady Soul"
84  Aretha Franklin "I never loved a man the way I loved you"
83  Jimi Hendrix Experience "Axis: Bold as Love"
Good parts, not so good parts. "B-"
81  The Clash "The Clash"
79  Led Zeppelin "Led Zeppelin II"
Not my favourite Zeppelin album, but still good. "B-"
78  Otis Redding "Otis Blue"
77  AC/DC "Back in Black"
Not a big AC/DC fan. Some classics here though "C+"
76  Prince and the Revolution "Purple Rain"
When Doves Cry is a good song. "C+"